Arthur A. Levine Books, 9780439488914, 40pp. The illustrator of the highly acclaimed FRIDA makes a smashing debut as an author. Every morning the Night Eater runs through the sky, gobbling up all the darkness. He eats cloudy nights as light and sweet as cotton candy, and deep dark nights that taste like bitter chocolate. 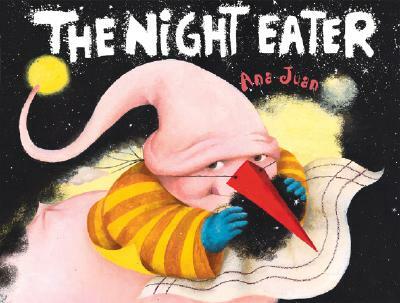 His favorites are bright clear nights -- the stars tickle his nose as he swallows! But what if the Night Eater doesn't come? Without him to devour the dark, the night animals won't go back to their dens . . . the earth and all the people grow very pale and cold . . . and children everywhere long to play in the sun. Can they convince the Night Eater to return to the skies?